Wow! Time flies. I feel like this week zoomed on by and now I’m facing deadlines for DPT school and there is absolutely no time to waste. In light of how stressful the holidays (and school deadlines!) can be, let us take a moment to Lighten Up. 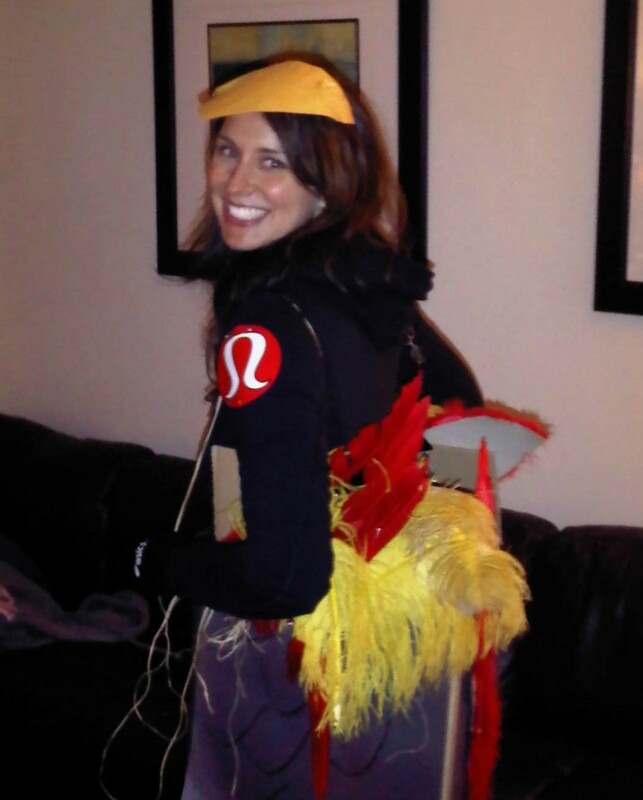 That is me, dressed in my turkey costume for the 1st annual lululemon athletica 5K Turkey Trot. 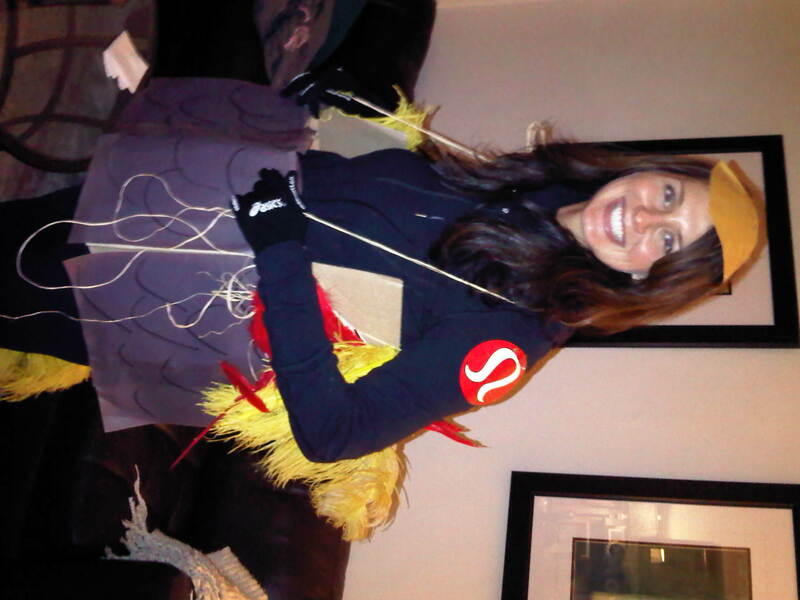 I may not look much like a turkey, but my costume was made with love, feathers and ridiculous amount of silliness. As “race director” (man, oh man do I use that term loosely! ), I could have shown up in my chic luluelmon attire and raced with my fellow trotters around Central Park without having people stare at me, wondering what the tall girl in the feathers was doing in a cardboard box ringing a cowbell. That would have been fine. I went the other way because it’s a Turkey Trot! Lighten Up! Have some fun, don’t race for time, let the box slow you down and stop when people ask why you’re dressed that way to tell them that, yes, a grown woman is still free to dress like a turkey when she feels the spirit move her. Lighten Up. It’s not all serious. An amazing view from behind. Feathers! But the other stuff, the stuff that really isn’t that deep, that’s where we need to Lighten Up. Do a Jingle Bell Run for fun and wear bells on your shoes. Dress as Santa for the Santa Claus Shuffle. Rent an Elvis suit for the Rock ‘n Roll Marathon/Half-Marathon in Vegas this weekend. Wear a funny hat and sunglasses with the year “2012” on them for the Midnight Run. Lighten Up. Last week, before our trip to Florida, I had to check in with Dr. Boz. He decided he didn’t like what was going on and blah, blah, blah, ordered newer, stronger meds for me and pumped me full of IV drugs to help me feel better. What's this brown stuff going into my arm? In between giving me the rundown on my not-so-awesome-but-they’re-going-to-get-the-job-done drugs, we actually spent the majority of the time during my appointment swapping holiday Outlaw stories and chatting about how a good kitchen set-up makes it so much easier to cook Thanksgiving dinner. See? Lighten Up. Yes, moon face is probably on the horizon for me as we taper the ‘roids, but it’s not the end of the world! 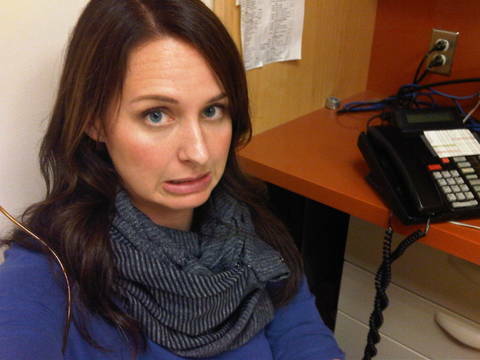 There are drugs on the way to helping me kick this flare-up and start off the New Year on a good health note! So, Lighten Up! Lighten Up! Run for fun instead of for time. Lighten Up! Have a sense of humor about yourself. Lighten Up! Don’t try so hard to tell everyone how sainted you are. Lighten Up! Let that less-than-flattering picture on Facebook stay up as a testament to how much fun you have and how confident you are. Lighten Up! Fall over in yoga class (or in the privacy of your own home gym) and laugh. Lighten Up! Quit criticizing everyone else’s everything. Lighten Up! Life is hard for you to be wound so tightly all the time. I can be an uptight ninny sometimes, so I love the moments in life that remind me to Lighten Up. Like the Turkey Trot or my doctor and I comparing Thanksgiving cooking styles as he drugs me up. I love the people in my world who remind me to Lighten Up. Those moments when I truly Lighten Up make being here much better than being there. And that’s what BTATs are all about. « Older Post …By New Year’s Day 2012	» Newer Post No Time To Run? Run Faster.